A week into having borrowed a friends turbo and I am a convert! 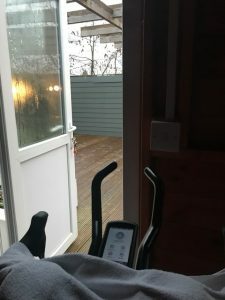 I can see that a turbo is not just for Winter but a great addition to all year round training. Imagine that many people are now shaking their heads… I’m not suggesting that it will replace riding outside (of course not that would be STUPID even for me), but it does offer some important possibilities. This post is my first thoughts and impressions after my first week of building it into my self created plan. I have resisted a turbo trainer very effectively so far in my chequereed cycling career. The general rational being that my borden threshold is such that peddling in a cold out building really does nothing for me. I would become bored. Then I wouldn’t focus on the session, which would render it useless. No progress would be made. No… Better for me would be to continue to use the WattBikes at my local Virgin Active gym. After all I pay a monthly fee to be a member, so I may as well get some value. The worked perfectly until over the course of the past few months the sophistication of my training has (fractionally) increased whilst the standard of maintenance and state of repair of the gym bikes as properly plummeted. Some attach to my watch, of which a subset seem to transmit power data. Some just switch off mid session and one has a cleat stuck in the pedal from some previous members failed attempts at unclipping. Increasingly irritated by not being able to complete and record my session, I decided I needed to do something better. And so I borrowed a basic traditional turbo trainer and set it up in my bike shed. Perfect it fitted! Whilst this is a basic non-smart trainer, the configuration works really well. I found a very old ‘training’ wheel that was the stock rear wheel that my Trek came with. That hasn’t seen any action for a LONG time! Threw on a spare cassette and a tyre that we replaced prematurely (I do that to avoid punctures – a strategy that has worked very well). I already use Garmin Vector pedals so have ready access to power data. It transpires that Garmin Connect and the 1030 head unit I am using allows me to create a training session and then it gives a specific screen with lots of great visual feedback as I work through it. This would work just fine. But I think if I’m going to invest then it always pays to buy the best kit your budget will allow. Decided to not purchase the WattBike Atom as I think time on my actual frame(s) is going to be important. I want my body to fully adapt to that geometry be it road or TT frame. Next choice was to go for a direct drive turbo rather than one that retains the bikes rear wheel. This choice was led by the fact that direct drive gives a much smoother but also more controllable and realistic ride. Of course being on a trainer is not ever going to be the same as being on the road. You don’t have to balance or deal with weather and the environment. Therefore you are not using the exact same muscles at which point it becomes materially different. But equally you can execute a very specific training session, working to power output and it will be far easier and safer than trying to execute the same on the road… Other than the state of the gym WattBikes, this level of control is the other key reason I have gone this route. And to my earlier comment – I can see a need to use the turbo all year so I can blend together road time and specific training sets. This should work very well! Having arrived at the direct drive version of a trainer the final consideration was to buy one that gives the most range of hill simulations and therefore has the most powerful wattage. Essentially it turns out that each of the main manufacturers have a model at the top of their ranges that tick my boxes and are all pretty much the same as each other. So final choice was based purely on price and deals on offer.